Human-wildlife conflict (HWC) is a serious problem in many parts of the world, and Bhutan’s Wangchuck Centennial National Park (WCNP) is no exception. Located in the remote alpine areas of the eastern Himalaya, wildlife species such as snow leopard (SL) and Tibetan wolf (TW) are reported to kill livestock in many parts of the Park. Such depredation is believed to have affected the livelihoods of high-altitude herding communities, resulting in conflicts between them. This study provides analysis on the extent of livestock depredation by wildlife predators such as SL and TW and examines its implications for the livelihoods of herding communities of Choekhortoe and Dhur regions of WCNP. Using semi-structured questionnaires, all herders (n = 38) in the study area were interviewed. The questions pertained to livestock population, frequency of depredation and income lost due to depredation in the last five years from 2012 to 2016. This study recorded 2,815 livestock heads in the study area, with an average herd size of 74.1 stock. The average herd size holding showed a decreasing trend over the years, and one of the reasons cited by the herders is depredation by SL and TW and other predators. This loss equated to an average annual financial loss equivalent to 10.2% (US$837) of their total per capita cash income. Such losses have resulted in negative impacts on herders’ livelihood; e.g. six herders (2012-2016) even stopped rearing livestock and resorted to an alternate source of cash income. The livestock intensification programmes, including pasture improvement through allowing controlled burning, and financial compensation, may be some potential short-term solutions to reduce conflict between herders and predators. Issuing permits for cordyceps (Ophiocordyceps sinensis) collection only to the herders and instilling the sense of stewardship to highland herders may be one of the long-term solutions. Conflict between wildlife species, especially carnivores and humans, is a serious concern in many parts of the world (Holmern et al. 2007; Ripple et al. 2014), since carnivores play an important role in functioning of ecosystems. Carnivores usually occupy large areas and kill their prey including livestock, which as a result created conflicts with rural pastoral communities (Ripple et al. 2014). Such conflict involving livestock depredation by wildlife in the Himalayan region, is particularly serious where livestock-rearing forms the integral part of the local economy (Wang and MacDonald 2006). Conflicts can get even more critical when rural communities live within and at the periphery of the protected areas (PAs) (Saberwal et al. 1994) and when they are exposed to conflicts with iconic wildlife species such as SL (Panthera uncia) (Saberwal et al. 1994; Mishra 2000). SL is categorised as vulnerable by the International Union for Conservation of Nature and Natural Resources (IUCN), under Appendix I of CITES and listed in Schedule I of Forest and Nature Conservation Rules and Regulation of Bhutan, 2017. Schedule I includes a list of totally protected animal and plant species in Bhutan (Department of Forest 1995). Bhutan is not an exception to such conflicts as local rural pastoral communities live within the PAs (Sangay and Vernes 2008, 2014) and these communities are highly dependent on the natural resources for their livelihoods (Katel et al. 2014). In fact, human-wildlife conflict (HWC) in Bhutan is increasing significantly, and this could be due to the fact that almost all the PAs support some form of land use, such as crop farming and livestock rearing (Wang 2004). While people live in the PAs this would increase the chances of them being exposed to the wildlife species, resulting in conflicts (Jackson and Wangchuk 2004; Fox et al. 2002) as PAs form the habitat and/or a migratory route (Jamtsho and Wangchuk 2016) for wildlife species. There are studies on large carnivores (Sangay and Vernes 2014), wild dog (Katel et al. 2014), human-elephant conflict (NCD (Nature Conservation Division) 2018), National SL Survey (DoFPS (Department of Forests and Park Services) 2016) and human-bear conflict (Jamtsho and Wangchuk 2016); however, there is sparse information on HWC pertaining to SL and Tibetan wolf (TW). SL is found in the high mountains of central and south Asia with a total potential habitat of about 1,835,000 km2 in the elevation range of 3000 to 5500 m (Schaller 1977; McCarthy and Chapron 2003). The population of SL is found to be decreasing mainly due to retaliatory killing, poaching for wildlife trade, habitat degradation and prey depletion (McCarthy and Chapron 2003; Jackson et al. 2008). In Bhutan, SL is found in the high altitude areas of Wangchuck Centennial National Park (WCNP), Jigme Dorji National Park, Jigme Khesar Strict Nature Reserve, Jigme Singye Wangchuck National Park, and northern part of Paro which connects to other habitat in the region (DoFPS (Department of Forests and Park Services) 2016; Ministry of Agriculture and Forests 2017). TW (Canis lupus chanco) is a carnivore species belonging to a subspecies of gray wolf and found in Tibet and the Himalayan regions of India and Nepal (Mech and Boitani 2010). TW is listed as species of least concern in IUCN although its presence is found to be rare in the Himalayan region (Mech and Boitani 2010). Shrestha (2013) reported the presence of TW in Bhutan for the first time and that too from WCNP. Earlier TW was reported from Trans-Himalayan regions of India such as Ladakh in Jammu and Kashmir, Lahaul and Spiti in Himachal Pradesh, northern Sikkim and Uttarakhand (Rodgers and Panwar 1988; Chundawat and Qureshi 1999). In the Indian Himalaya and Nepal Himalaya, the presence of SL and TW added to the conflicts with local pastoral communities in addition to the already persistent conflicts with other large carnivore species tiger, dhole, wild dog and Asiatic black bear - (Bhattacharya and Sathyakumar 2010; Chhetri et al. 2017). One of the most commonly stated reasons for conflicts is the habitat overlap of the wildlife species which could have led to competition for prey between them (Jumabay-Uulu et al. 2013; Wang et al. 2014). Habitat overlap also means competition for more prey species for survival, and in the case of such competition, it may result in livestock depredation. The livestock depredation by SL leading to loss of local economy is already documented (Suryawanshi 2013). The losses of livestock due to SL and TW depredation, in the Himalayan region, are considerable where the rate of depredation ranges from 3 to 18% annually (Oli 1994; Namgail et al. 2007). According to Namgail et al. (2007), in Gya-Miru Wildlife Sanctuary in Ladakh, India, alone, 60% of the total livestock losses due to predators were comprised of domestic goats (Capra aegagrus hircus) (32%), sheep (Ovis aries) (30%), yaks (Bos grunniens) (15%) and horses (Equus caballus) (13%). Similarly, in Hemis National Park of Ladakh, 90% of livestock killed were goats and sheep; however, adult yaks are rarely depredated except by large packs of dhole (Cuon alpinus) and large predators like leopards (Panthera pardus) and tigers (Panthera tigris) (Bhatnagaer et al. 2000). SLs are reported to predate relatively more on horses than other livestock (Mishra 1997; Oli 1994; Jackson and Wangchuk 2004). The horses are important to the local rural people as they are used for transportation of goods in an area inaccessible to motor transport. The HWC was also commonly found in WCNP because communities are relatively more exposed to wildlife species such as SL, TW and other species (Sangay and Vernes 2014) as they live in and around the national park. According to Kinga (2014), six predators including SL and TW reportedly killed 521 livestock from 2009 to 2013 in WCNP. Among those killed were yaks, horses, ox (Bos taurus) and sheep in the percentages of 90.6, 1.5, 0.2 and 7.7 respectively. While there are studies on HWC pertaining to other wildlife species (Wang and Macdonald 2006; Sangay and Vernes 2014), the conflict pertaining to SL and TW wildlife species is not clearly known despite their presence in Bhutan over a long time. Therefore, a clear understanding on the extent of conflicts between the pastoral communities and the wildlife species involved is essential for framing suitable species conservation and rural human development. It is known that livestock depredation in the higher elevation is mainly caused by SL and TW (Jamtsho and Wangchuk 2016); however, the extent of losses that caused the pattern of depredation is not yet understood. Scarce information means that details are lacking about various aspects of the conflict and this compromises implementation of effective, relevant and specific solutions to reduce the conflicts. Therefore, this study intends to analyse the extent of livestock depredation by SL and TW and implications for herders’ livelihoods in WCNP, in particular to understand the difference in depredation according to seasons and age groups of livestock. The central part of WCNP was selected as a study area, with a total area of 1275 km2, which encompasses 25.9% of the park area (Figure 1). WCNP was declared as a PA in 2008 and is the largest PA of the country with a total area of 4,914 km2. The park is the latest addition to Bhutan’s PA system. Located in north-central Bhutan (27° 48′ N, 90° 39′ E), WCNP provides for much needed ecological connectivity in the Bhutan Himalaya, linking JDNP to the west and Bumdeling Wildlife Sanctuary (BWS) to the east. Permanent snow-covered mountains such as Gangkar Puensum, Rinchen Zoegila and Jazayla exist in the park, and their glaciers serve as water towers to Bhutan’s major river systems including Punatsangchu, Mangdechu, Chamkharchu and Kurichu. Maximum and minimum temperatures recorded during this study were 10 °C and − 20 °C, respectively. As with the other regions in the Himalaya, there is a pronounced seasonality in climatic pattern. Winter normally starts from November and lasts until February and is generally cold and dry. Snow and ice start to thaw in March and April. The major land cover consists of 27% snow cover, 22% rock outcrops, 18% shrubs, 12% meadows, 12% blue pine forest, 5% mixed conifer forest and remaining with moraines, lakes and agriculture land. Map data source: GIS unit, Forest Resource Management Division, Department of Forests and Park Services, Ministry of Agriculture and Forests, Bhutan. The study specifically targeted 38 herders who mainly depend on yak husbandry, and practise a long-established traditional seasonal migratory pattern. After completion of winter months, herders migrate up to alpine pastures before the onset of summer and graze their livestock in alpine areas until autumn, then descend down to wintering pastures following the same route. This demands a high degree of cooperation among herders as most use the same route for migration and some even share the pasturelands. Each herder possesses an exclusive use-right for the designated grazing grounds (tsamdro1), and they move their herds three to eight times during the grazing period. As the herders seasonally move their livestock along the altitude gradients from as low as 2,500 to 4,500 m, the livestock are depredated by different predators while migrating along the migratory route, both during ascent and descent along the elevation gradient in different seasons. All herders graze their livestock in both natural and tethered pastures during the day. During the night, they pen their livestock, mostly keeping them unattended. Normally, the milking yaks are tethered; the adult male yaks are released for free grazing and younger ones are pen their herd. Besides livestock husbandry, the cordyceps (caterpillar fungus) collection and sale contributes substantially to herders’ cash income, although the income from corydceps is not always reliable. Therefore, the herders treat yak herding as a regular activity and cordyceps collection and sale as only seasonal and a secondary option. The study area was stratified into two regions namely Dhur and Choekhortoe. The stratification was done because these two regions are isolated from each other and their grazing and resource collection sites are delineated since ancestral times. Dhur has two villages consisting of 17 herders who do not own registered land and are therefore totally dependent on yak and sheep husbandry. Choekhortoe has seven villages with 21 semi-nomads who rear yaks and also conduct off-herd activities. The survey took into account all 38 herders of WCNP and had the opportunity to meet heads of all herds. The questions asked includes household demographics, number of livestock owned, herding pattern, livelihood strategies, number and type of livestock lost to predation and income lost from depredation. The standard pre-tested questionnaires were administered to collect the data. Moreover, interviews were all conducted by WCNP park staff who have worked with these communities for several years. This is expected to minimize likelihood of receiving inaccurate responses. Demographic and livelihood data were cross-validated with the district veterinary office of Bumthang Dzongkha.2 The information on livestock lost to predation and the herding practices was validated with the records maintained at the park head office. Descriptive statistics were used to describe the mean livestock holdings and depredation rate. Levene's test was used to verify equality of variance in the samples (homogeneity of variance) of livestock holding between two different regions. As the data was normal, ANOVA was used to compare the mean between severities of conflicts in different locations. One-sample t test was used to check the difference in numbers of livestock from 2012 to 2016 as it helped to compare between the group means of each year. Correlations were applied to determine the relationship between conflict seasons and herd migration periods, severity of conflict and choice of age by predators. Kruskal-Wallis test was used to see the difference in income between the two different villages. The socio-demographic characteristics of the respondent (Table 1) show that there is no significant difference in respondent’s age between the two regions (i.e. Choekhortoe and Dhur), F (1) = .042, p > .05, which helped in making fair comparisons between the regions. There is however significant difference in the total members per household, Z = − 5.051, p < .05, and actual members living per herd, Z = − 5.391, p < .05, in the two regions, which indicates that there were differences in the number of family members engaged in daily household activities - families with more members could guard and supervise their livestock more than families with lesser members. The herders have multiple sources of income, though mainly dependent on yak husbandry and cordyceps collection and sale. In general, 94.7% of the herders consider livestock as a primary source of income and cordyceps collection and sale as a secondary source of income for their families. However, 5.3% of herders consider cordyceps collection and sale as the main source of annual income. Some 67.7% of the herders practise backyard farming to obtain basic agriculture products. None of the herders in the study area farm to sell products. Some 63% of herders also collect alpine medicinal plants in small quantities for self-consumption. Occasionally, herders also take the opportunity to transport tourist products (food, cooking utensils, tents, personal baggage) when tourists come hiking in their areas. Annually, herders in Choekhortoe earned a total of US $36,992 ($1,760 per herder) while Dhur earned US $22,458 ($1,320 per herder) from the sale of livestock products (Table 2). The average cash income from livestock between the two regions showed no significant difference, H (2) = 2.950, p > .05. From cordyceps collection and sale, Choekhortoe earned US $129,461 ($6,164 per herder) and Dhur earned US $121,153 ($7,126 per herder). The income from cordyceps business contributed significantly (rs = .84, p < .001) to the total annual income of herders. On the combined analysis, the annual average income for herders is found to be US $8,159 ± 3,150. The annual average income estimated for the herders of Dhur is US $7,926 and for Choekhortoe is $8,447. There was significant association between income from livestock and total livestock holding owned, rs = .4.34, p < .05, indicating that more number of livestock owned led to increased annual income. However, the two regions did not vary significantly in their overall average annual income, H (2) = .062, p > .05. In 2016, the respondents reared a total of 2,815 head of livestock with an average herd size of 74.07 head of stock (Table 3). Ownership of livestock by households was highly skewed (range 26–143 stock per household). All herders reared yak and horses and 29 herders also kept dog and 3 herders also reared sheep. However, none of herders reared local cattle. Choekhortoe ‘s 21 herders had a total livestock population of 1,593 head, and Dhur consists of 17 herders with total livestock population of 1,222 head. In both regions, yaks are the most dominant livestock and dog is the least numerous domestic animal. The total livestock holding in the study area decreased from 2,995 head (78.8 ± 78.8) in 2012 to 2,815 (74.07 ± 28.2) in 2016. In Chokhortoe alone, the total livestock population decreased from 1,663 heads (79.19 ± 28.7) in 2012 to 1,593 heads (75.86 ± 27.1) in 2016, while in Dhur, it decreased from 1,332 (78.35 ± 36.5) in 2012 to 1,222 (71.9 ± 30.23) in 2016. The decrease in livestock population was mainly due to a decline in the number of yak herders from 44 in 2012 to 38 herders in 2016. The 92% of herders reported that decline in number of herders is mainly aggravated by an increase in depredation by wild predators over the years and remaining 8% reported that decline is mainly due to grazing problems, livestock diseases and also due to livelihood being substantiated by cordyceps collection and sale. In the past five years (2012–2016), 666 livestock lost to predators included 625 yaks, 34 sheep and 7 horses. The average annual losses for yaks, sheep and horses were recorded as 3.3, 0.2 and 0.36 heads per herd respectively. SLs and TWs were responsible for the maximum predation, being blamed for 32.6% and 24.2% respectively, while tiger, wild dog and black bear (2.3%, 17.8% and 23.1% respectively) were claimed to be responsible for the remaining 43.2% of livestock loss. The majority (55.3%) of livestock killed were adults, and the remainder killed were 37.6% young and 6.8% yak heifer. Specifically, 64% of SL kills were young livestock, 27.9% kills were adults and only 8.1% were heifers. In contrast, TW killed 73.4% adult livestock, 21.9% young and 4.7% yak heifers. It was found that there is a significant association between the predator and the choice of age (rs = .257, p < .05). The 67% of total yak kills are from Choekhortoe and only 32% from Dhur. However, sheep kills are all reported from Dhur, accounting for an average herd loss of 4.9 ± 3.3 sheep per herd. In addition, 71.4% horse kills are from Dhur while 28.5% from Choekhortoe. There is a significant difference in the mean livestock depredation between the two regions (t = − 10.8, p < .05). In all, 70.5% of total kills were in summer and 19.2% during winter. The autumn and spring times had less depredation rates with 7.6% and 2.7% respectively. A total of 84.5% of the attacks in Choekhortoe happened in summer and only 6.9% during winter. The remaining attacks were during autumn (5.7%) and spring (2.9%). In Dhur, summer and winter had equal frequencies of attacks (43.3% each). Autumn had 11.1% and spring with only 2.2%. The depredation of yaks by TW and SL occurred from spring to autumn, coinciding with livestock grazing in alpine pastures, while livestock depredations by wild dog and tiger occurred mostly in winter when livestock migrate to winter pastures in lower latitudes. There was a strong association between the predator and the choice of season for attacks (rs = .279, p < .05). The time of kill by predators mostly happened during the night in Choekhortoe (68.4%) and the single bigggest time of attack in Dhur was day time (41.4%). However, a considerable number of respondents did not know the exact time of attacks in both regions. The relationship between the preferences of time by predators in both regions was also not significant (rs = .029, p > .05). The total yak loss attributed to SL in the previous five years is $22,392 ($117/year which is 1.4% of the herders’ total annual income), of which maximum loss occurred in 2015 and minimum in 2013 (Table 4). TWs were responsible for total yak depredation worth $53,862 that amounted to $283 per herd and 3.5% of herders’ total annual income. Tiger, black bear and wild dog were collectively held responsible for the depredation of yaks worth $80,985. Overall, each herder household lost an estimated monetary value worth $837 from depredation, which is equivalent to 10.2% of the annual household cash income. The livestock herding practices in Bhutan have existed since time immemorial. In fact, farming and animal husbandry have become important components of the Bhutanese economy, providing employment and livelihoods for approximately 69% of the Bhutanese population and contributing substantially (33%) to the gross domestic product (Sangay and Vernes 2008). Livestock herding forms one of the most important sources (Wang and Macdonald 2006) of income for Bhutanese living in rural areas. In rural Bhutan, herders practise open grazing in the forest or in pastures almost all year round. One of the most crucial issues for this herding population, including other farmers, is the human-wildlife conflict due to depredation of livestock by wildlife species. In recent periods, human-wildlife conflict in Bhutan has increased (Wang and Macdonald 2006). Compared to many other places in the Himalayan region, herders in the study site rear livestock with an average herd size of 74 stock, which is more than twice as large as Phu valley and three times as large as Manag of Nepal (Wegge et al. 2012). Relatively, the larger herd sizes in Bhutan are associated with the availability of grazing areas and high dependence of herders on livestock husbandry. Herders in Bhutan practise the traditional migratory (Shrestha 2013) herding pattern that demands a high degree of cooperation among herders, both in sharing pasturelands and protecting their livestock from wild predators. The herding pattern in the study area has been described as transhumance (Shrestha 2013), as herders rotate their stock from summer to winter pastures along the altitudinal gradient, taking livestock to higher elevation during summer and bring down in winter; this cycle is repeated every year. Herders in Bhutan take their livestock to their registered grazing ground called tsamdro. Each herder possesses an exclusive use-right for the designated tsamdros and herders are expected to graze their livestock in their registered respective tsamdro. Depending on the availability of forage in the pastures, herders move their herds three to eight times during the grazing period. In each tsamdro, they spend from one to three months depending on the season. Herders maintain the tsamdro by occasionally burning the pastures. This is carried out to maintain or improve quality of forage and suppress the growth of unpalatable plants. Such herding practices of migrating herds to higher and lower elevations and including the maintenance of pastureland is very similar to that of some groups of herders in Qilianshan of Gansu Province in China (Alexander et al. 2015). While herding livestock, the depredation of livestock by wildlife species, shortage of pasture land and animal diseases are some of the problems faced by the herders in our study area. The grazing problem rose after the establishment of WCNP in 2008 owing to a complete ban on burning of pasturelands. The park officials patrol the area occasionally to supervise the pastureland and other wrong-doings in the park. The burning ban in the grazing area in Qilianshan in China has also led to problems (Alexander et al. 2015). The correlation between incidences of animal diseases and herding practices warrants a further study. However, by looking at the number of cases mentioned in our case study, the problem of animal disease is not as severe as that in the Sanjiangyuan region of the Tibetan plateau, where disease caused about four times the number of the alleged livestock losses as compared to depredation by SLs (Li et al. 2013). Even in Qilianshan in China, natural disasters and diseases were responsible for 65% and 63% of livestock loss respectively (Alexander et al. 2015). The fewer number of disease cases could be due to continuous effort and supervision from the district veterinary office in our case study area. The depredation by wildlife is treated as the most severe problem, which has led to a decline in herders and livestock population in the study area.The herders in the study area have several sources of income, mainly dependent on livestock husbandry and cordyceps collection and sale. They consider livestock herding as the prime source of income besides the fact that cordyceps collection and sale contributes more to their annual income, because they found cordyceps collection and sale production and price not reliable. Moreover, cordyceps are considered as state resources and any eligible collectors can come and collect, which is why the numbers of collectors have increased drastically over the years. This study recorded a decline of six herders from 2012 to 2016. WCP (WangchuckCentennial Park) (2008) reported the decline in 10 yak herders in 10 years in Choekhor gewog3 and 17 yak herders in five years in 2014 (Kinga 2014). The drop in the numbers of yak herders is aggravated by the increase in depredation of yaks by wild predators and also due to livelihoods being supplemented by cordyceps collection and sale. The households with fewer heads sold their yaks to the neighbours, as migrating around the year between the pastures became uneconomical. There is a high correlation between total income and income from cordyceps business, indicating that cordyceps business contributed significantly to the total income of herders. This finding is consistent with that of Wangchuk et al. (2013) in the WCNP and Qinghai-Tibet plateau (Winkler 2008) that sale of cordyceps contributed a major share to the collectors’ annual income. The mean annual income of herders (US$8,839 per herd) is found to be relatively higher than the income of the farmers and herders (US$250) in Jigme Singye Wangchuck National Park (JSWNP) and the income (US$900) in Toebesa gewog of Punakha dzongkhag (Wang and Macdonald 2006; Katel et al. 2014). This is because the income for herders in WCNP is greatly supplemented by cordyceps collection and sale, which is not the case for herders and farmers in JSWNP and Tobesa gewog. Cordyceps collection and sale is more profitable than herding livestock. The average annual income from sale of cordyceps in the study area is 18 times higher than earlier reported by Wangchuk et al. (2013) in the same study area. The difference in the annual income from the same study area is that the result reported by Wangchuk et al. (2013) is for all the people who were collecting and selling while the result in this study is reported only for herders. With more access and collection experiences, herders are presumed to be collecting in more quantities than other people who are also collecting and selling in the same study area. The increase in mean cash income could also be due to the increase in market prices in recent years, for example by eight times between 1998 and 2008 in Qinghai, China. The highest quality can retail up to US$100,000/kg and the lowest quality at US$8,000/kg (Alexander et al. 2015). The results showed that 666 livestock were depredated in the last five years (from 2012 to 2016), and the main predators were SL and TW. The high predation levels on livestock by SL and TW have also been reported from other parts of their range as well (Schaller 1977; Fox and Chundawat 1988; Mallon 1988; Oli et al. 1994; Nowell and Jackson 1996). The livestock kill can vary by site, livestock type and presence and absence of herder and also the presence or absence of predators (Jackson 1999). For instance, the greatest proportions of livestock kills in the lower elevation region of WCNP are by black bear (Jamtsho and Wangchuk 2016). The average loss per herd per year in study area is 3.26 head which is relatively higher than that of JSWNP where the mean loss per household was 1.29 head of livestock (Wang and Macdonald 2006) and Toebesa gewog of Punakha dzongkhag where the reported mean loss is 0.21 head of cattle per household (Katel et al. 2014). The difference in mean could be explained by the difference in the number of livestock holdings, livestock herding practices and availability of prey species. WCNP has an average livestock holding of 74 stock per herd, while in Tobesa gewog, it has only 3 stock per household. This is because all respondents in WCNP are nomads who depend entirely on livestock husbandry where as in JSWNP and Tobesa, they are farmers who rear livestock just as a part of farming practices. In WCNP, herders practice the traditional migratory herding pattern while in Tobesa and JSWNP, they practice a sedentary herding system. In the traditional migratory pattern, the livestock are grazed in different zones in different seasons, which exposes livestock to different predators. However, the study area has a lower rate of depredation than northern Nepal, where 159 heads of livestock were predated by SL annually which is equivalent to the annual predation rate of 15.1% (Wegge et al. 2012). With regard to the season of depredation, both the regions have high rate of depredation in summer season, coinciding with when livestock are grazed in alpine areas. In summer the livestock and more frequently moved from one place to the other, from three to seven times per season and thus more exposed to predators than in winter where shifting would happen only three to four times. The depredation of livestock by TW and SL occurred from spring to autumn, coinciding with livestock grazing in alpine pastures, while livestock depredations by wild dog and tiger occurred mostly in winter when livestock migrate to winter pastures in lower latitudes. Sangay and Vernes (2008) also reported that predation by SLs was maximum during the peak summer months of June and July, while minimal cases were reported in the months of April and September, and few cases or number of predation on other times of the year. On the other hand, depredation by other predators such as tiger, wild dog and black bears mostly happened in late autumn through early spring and these cases were mostly reported from the lower elevation regions (Jamtsho and Wangchuk 2016). In the current study, the TW are found to depredate only on yaks, while SL depredated on both yak and sheep. According to Sangay and Vernes (2008) yaks and horses were depredated by SLs in high altitude meadows during grazing. Predation hotspots is one factor associated with rate of depredation and the type of prey species selection by predators; the higher the rate of encounter between the prey and the predator species, the higher the reported cases on rate of depredation (Wolf et al. 2015). In some other cases, the abundance of livestock is also cited as one of the important factors leading to the higher incidences of depredation (Yom-Tov et al. 1995). Even in our study area, the higher level of unsupervised grazing has led to increase in depredation cases. The livestock kills vary by site, livestock type and presence and absence of herder (Jackson 1999). With reference to predators’ choice of prey age group, SL preferred young livestock in the study area and this is consistent with the result reported from Qilianshan in China where all the livestock depredated by SL were young (Alexander et al. 2015). In contrast, TW choice of prey is for adult livestock. This may be because SL hunt alone and they normally go for young animals, whereas TW normally hunts in packs and they can take the adult animals. Annually, each herder lost on average approximately 8.5% of their annual household cash income due to depredation. The average loss calculated for the current study is higher than the average depredation loss in JSWNP (Wang and Macdonald 2006) and average loss in Tsarap valley in north India (Spearing 2000). The maximum losses attributed to SL and TW were calculated as 0.1% and 3.5% of the herder’s total annual income respectively. The difference in the depredation loss between the two prey species could be due to the incidences of the depredation differences on young and adult livestock. TW depredated more on adult yaks, which are valued significantly higher than the young yaks and the sheep. The losses in the study area are four times higher than those in the Kibber Wildlife Sanctuary (Mishra 1997). According to herders, the rate of depredation cases has been increasing and such losses affect their livelihood. It was observed that there was a decline in herders as well as livestock population in the study area, one reason being the livestock were depredated by different predators at different elevation zones and different times of the year. The loss of livestock has an impact on the herding community to the extent that some herding households even stopped rearing livestock due to the fear of losses to wildlife species, and instead resorted to collection and sale of cordyceps. Although the size of the herding community living in the WCNP is significantly lower than that of the other communities reported from the Himalayan region, the loss of livestock due to depredation appears to be significantly higher than other regions. This study however suffers from weaknesses since it could not be concluded whether the higher depredation rate of livestock happened due to the higher density of wildlife species in the WCNP or whether the depredation is higher because of the higher number of yaks grazing freely in the hotspot areas of different wildlife species. It is however clear that the loss due to livestock depredation has significantly impacted the herders’ annual income, resulting in negative attitudes of the herding community towards wildlife species conservation. This study also suffers from weaknesses on recording habitat overlap and diet of the different wildlife species, which may reveal whether the kill preference of the wildlife species is livestock or whether the frequent interactions lead to the higher rate of depredation. Therefore, it is essential to understand the wildlife habitat, their overlap and migratory routes of those wildlife species. One of the solutions can be realized by reducing the number of livestock and keeping only the productive livestock, as well as implementing supervised grazing and developing effective corrals. A second solution could be realized by implementing a livestock insurance scheme in order to protect livelihood of high-altitude herding communities and reconcile biodiversity conservation. Our findings show that the two regions of Choekhortoe and Dhur reported different depredation rates, which also indicates that the reduction in livestock population may be partly influenced by peoples’ access to better alternative economic opportunities, which is also recommended for further study. Livestock intensification programmes, including pasture improvement and financial compensation, may be a potential short-term solution to reduce conflict between herders and predators. Issuing permits for cordyceps collection only to the local herders and instilling the sense of stewardship to highland herders may reduce the conflicts between wild predators and herders. This is because with more income, herders could plan and improve their herding practices so as to better protect their livestock from wild predators, if the competition with outsiders for cordyceps collection can be reduced. Getting additional financial sources may help the herders improve their guarding practices through building proper herd and corral facilities. Tsamdro is a state reserve forest registered in an individual herder’s name as a grazing area. Dzongkhag is an administrative district in Bhutan. There are in total 20 dzongkhags in Bhutan. Gewog is an administrative block or sub-district in Bhutan. There are in total 205 gewogs in Bhutan. It was a tough time in the field, and we got full support from the team, thanks to Chandra Kumar Gurung, Dechen Norbu, Choki Gyeltshen and Jampel Nidup of Wangchuck Centennial National Park. Thanks to Netra Binod Sharma, UNDP, Bhutan for providing language help and proof reading the article. Lastly, thanks to anonymous reviewers for your critical comments. Rufford Foundation, UK, supported fund for field data collection. Royal Government of Bhutan supported with salaries for principal investigators. YJ collected and organised the field data and did the analysis and drafting of the manuscript. OK helped in the study design, assisted in the data analysis and supported in the drafting of manuscripts. Both authors read and approved the final manuscript. Ugyen Wangchuck Institute for Conservation and Environmental Research approved this study vide research clearance no UWICE/ADM27/2015-2016/275 dated 07/10/2016. Jackson, R. M. 1999. Managing people – Wildlife conflict in Tibet’s Qomolangma National Nature Preserve. https://www.researchgate.net/publication/237619564_PeopleWildlife_Conflict_Management_in_the_Qomolangma_Nature_Preserve_Tibet. Accessed 3 Aug 2016. Jamtsho, Y., and S. Wangchuk. 2016. 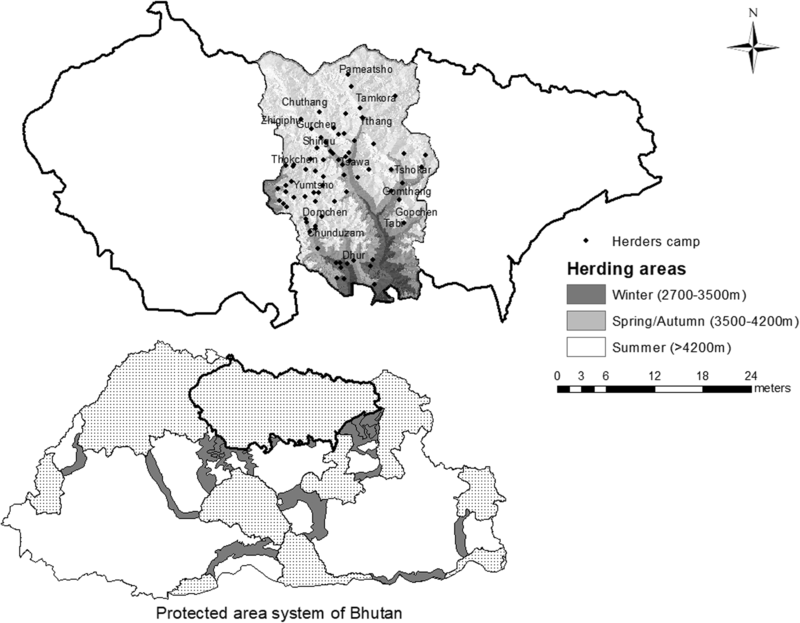 Assessing patterns of human–Asiatic black bear interaction in and around Wangchuck Centennial National Park, Bhutan. Global Ecology and Conservation. DOI:https://doi.org/10.1016/j.gecco.2016.09.004. Ministry of Agriculture and Forests. 2017. Presence of SLs in JSWNP confirmed! http://www.moaf.gov.bt/presence-of-snow-leopard-in-jswnp-confirmed/Accessed 3 Nov 2017. Ripple et al. 2014.Status and ecological effects of the world’s largest carnivores. Science DOI: https://doi.org/10.1126/science.1241484.